An ice sheet model that includes previously underappreciated processes indicates that sea level may rise almost 50 feet by 2500 due to Antarctic ice sheet melting if greenhouse gas emissions continue unabated, according to researchers from Penn State and University of Massachusetts, Amherst. "In this case the atmospheric warming will soon become the dominant driver of ice loss, but prolonged ocean warming will delay the recovery for thousands of years," the researchers report in today's (Mar. 31) issue of Nature. Antarctica was the primary contributor to sea level rise in the past and may be the primary contributor in the future because much of its ice sits on ground. Floating ice, like that of the Arctic Ocean, is already in the water and if it melts, does not raise sea level. The Antarctic contribution will also probably dominate melt from the smaller Greenland Ice Sheet. 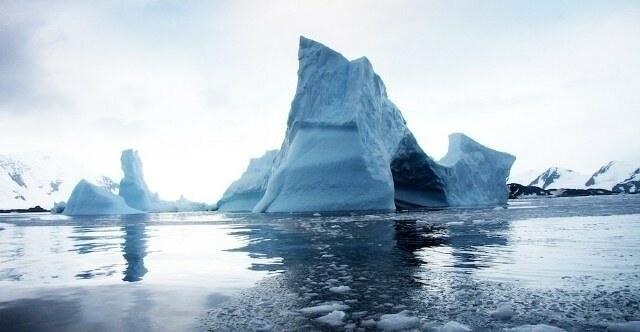 While only parts of Antarctica will melt in the worst case scenario, the melting suggested by the model would be sufficient to double the recent estimates by the Intergovernmental Panel on Climate Change for future sea-level rise over the next 100 years. "Recently we looked at the long-standing problem posed by geological evidence that suggests sea level rose dramatically in the past, possibly up to 10 to 20 meters around 3 million years ago in the Pliocene," said David Pollard, senior scientist in Earth and Environmental Systems Institute, Penn State. "Existing models couldn't simulate enough ice sheet melting to explain that." Ocean warming has previously been identified as the main cause of ice retreat occurring today. Warmer water quickly erodes the underside of floating ice sheet portions. Floating ice shelves act as buttresses for the grounded ice inland, whose base is below sea level. Once the shelves are gone, the grounded ice can move faster. However, in previous models, this process did not simulate enough melting to explain the past sea levels, with only West Antarctica collapsing even though similar areas in East Antarctica with huge amounts of ice could collapse in the same manner. Pollard, working with Robert M. DeConto, professor of geosciences, University of Massachusetts, Amherst, looked at two further mechanisms that could account for greater melting. The first mechanism is fracturing and deepening of crevasses on the low-lying floating ice shelves by pooling of surface meltwater and rainfall caused by warming air temperatures. If emissions continue unabated, this process will begin to dominate ocean warming within 100 years. It already caused the disintegration of the Larsen B Ice Shelf in 2002. The second mechanism comes into play once floating ice sheets disintegrate back to the grounding zone, leaving extremely high walls of ice. These walls are so high that simple physics says they cannot structurally support their weight, and then collapse into the sea, eroding the cliff further and further inland as long as the bedrock stays deep enough below sea level. Similar cliffs, with about 328 feet of ice above sea level and 2625 feet below, exist today at a few of the largest outlet glaciers in Greenland and the Antarctic Peninsula, where huge calving events occur regularly. Both of these mechanisms are known, but neither has been applied to this type of ice-sheet model before. The researchers incorporated the physics and tested the model, driven by high-resolution climate models and past climate data. The updated model reproduced ice-sheet retreat consistent with geologic sea-level data for the warm Pliocene and also for the last interglacial period around 125,000 years ago. Then they applied the model to the future, forcing it with various greenhouse-gas emission scenarios. "Although the future sea-level contribution in our model is greater than previously thought, it is based on credible mechanisms and is consistent with geologic evidence of past sea-level rise," said Pollard. "We regard the results as worst-case envelopes of possible future behavior, and the mechanisms should be considered seriously in future work.